Although its name associates to the European Union, EU Casino Mobile is no less South African than the rest of the casinos you may find on our site. It welcomes all South African players, allows them to deposit, play and withdraw in Rands, and, above all, offers an excellent choice of various casino games under fair and safe conditions. One thing does connect this casino to the Europe – it is registered in Malta and operates under the license issued by the Malta Gaming Authority. While SkillOnNet provides the software, EU Casino Mobile is supplied with the best games from multiple providers. Although SkillOnNet is not as popular as some other gaming companies, it is a fact that their casinos enjoy the status of fair and reliable gaming houses with ranking marks high above average ones. EU Casino Mobile is not an exception. On the contrary, this is one of the most trusted casinos within the SkillOnNet group. EU Casino is not stubbornly stuck with a single provider and you will be able to play many hit titles provided by SkillOnNet, NexGen, NetEnt and others. Accessing the games is as easy as possible – all you need do is visiting the casino web address using your mobile device. Your mobile browser is more than enough and no app is required. EU Casino holds the Malta Gaming Authority license and, in case that is not enough, the games are regularly tested by independent auditors to evaluate the random number generators. Their reports show that EU Casino games feature unpredictable and non-repeatable outcomes based on random number generators. In order to secure your information and make you feel safe, EU Casino Mobile uses industry standard security protocols such as 128-bit protection and SSL data encryption technology. EU Casino Mobile has every reason to boast of their game selection. We dare to say that the EU Casino’s game lobby could be a role model for the majority of South African mobile casinos. Once you enter this massive game library your biggest trouble will be where to start from, since you will be face to face with the most popular games from various providers. EU Casino Mobile is supplied with large quantity and excellent quality of various casino games provided by SkillOnNet, NetEnt, NextGen Gaming, Williams, Amaya, Mercur Gaming and Amaya plus a fantastic Live Dealer section powered by the Evolution Gaming. We’ve counted 160 slot games within the slots section of the game lobby, but this huge number is not the thing that took our attention. It is the selection of the games that sped up our hearts after we saw all popular games as well as the latest editions of worldwide acknowledged providers. Make a list of 10 of your favourite slots and we are pretty sure at least 7 or 8 of them are offered by the EU Casino Mobile. Not really into slots – no problem. Skip the slot games and go directly to Roulette section to play different versions of American, European and French roulette. If you prefer card games – pick your favourite blackjack, baccarat or video poker game. If you thought this is all, you were wrong – there is a first-rate Live Casino section you can access directly from your mobile device. EU Casino has employed Evolution Gaming to provide live dealer games, giving you the chance to play top-notch live games such as roulette, blackjack, baccarat and casino hold’em. With excellent game selection and powerful software, EU Casino Mobile offers a never-ending entertainment to all players who use either Apple or Android handheld machines. The casino is fully optimised for all kinds of iPhones, iPads, Android smartphones and tablets. Mobile browsers such as Safari or Google Chrome, backed up with a stable internet connection, will secure a fantastic gaming experience. 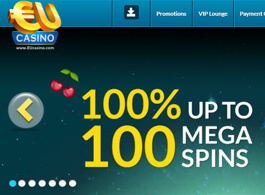 EU Casino is known for offering its players great bonuses and promotions on a regular basis. As of now players will not be able to take advantage of a No Deposit offer as EU Casino does not feature a No Deposit Bonus. However new players can take advantage of a great welcome bonus which has 100 Free Spins (1 free spin for every R10 deposited) + 30 Extra Free Spins. In addition to the welcome bonus, EU Casino offers different bonus every day of the week, so even after you become a regular player you won’t be deprived of generous bonuses. In order to become a real-money player, you will have to deposit at least R100 using one of the following methods: Visa, MasterCard, Maestro, Fast Bank Transfer, Eco, Skrill and Neteller. All these methods include a small fee that goes from 2% for the Fast Bank Transfer, 2.5% for the bank cards, 3.5% for those who use EcoCard and Neteller and 5% for Skrill. Your withdrawal amount can go from a minimum of R100 to the maximum of R50,000 and you have several methods at your disposal. The withdrawals are not subject to any fees, unless you use Wire Transfers. Other methods include credit cards, Neteller, Click2Pay, Skrill, Webmoney, ClickandBuy, SpeedCard and PaySafeCard. The only weak spot of this casino is the customer support. All other parts of EU Casino Mobile work by the highest standards in the industry and we are not sure why they didn’t pay more attention to the customer support. While the online version feature excellent 24/7 support that include the live chat, mobile users will have to satisfy with sending an email to the customer support team. - Fees on the deposits. EU Casino Mobile is the one of few mobile casinos offering the live dealer games to the South African players. And their live games are not there just to boost the game lobby – they are among the finest games on the market. On top of that, EU Casino is supplied with around 200 slots and table games provided by the most respectable gaming companies in the world. Offering enormous bonuses for the new players is a manner of new casinos trying to get as many members as possible. However, EU Casino has already a huge number of members, so they prefer providing a full casino experience along with the top-notch games and attract new customers in the long run.